What a weekend! After launching Born to Walk at Ben McNally Books in Toronto last Thursday evening with friends, family and fans (and wine), I gave talks and took questions from staff at both Indigo and Kobo headquarters on Friday — it was inspiring to meet so many people passionate about books and walking! The conversation at Kobo, hosted by director of merchandising (and fellow obsessive walker) Nathan Maharaj, will be on Mark Lefebvre’s Kobo writing life podcast in the weeks ahead. 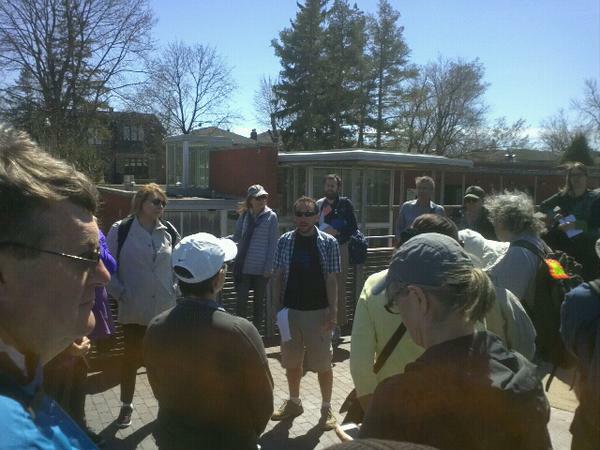 Then, on Saturday afternoon, I led a walk for Walk Toronto (above) in the neighbourhood where I grew up, Ledbury Park. About 40 people turned up, including Denise Pinto, the global director of Jane’s Walk; Brian MacLean of First Story Toronto, who told the group about the area’s indigenous history; and Helen Mills, founder of Lost Rivers, who poetically and powerfully explained why it’s important to understand and respect the city’s forgotten and vanishing waterways, one of which, Burke Brook (opening page image), was the highlight of our route. Thanks to everybody from coming out to all of these events. Oh, the Winnipeg Free press also ran a pretty sweet review of the book on Saturday. “Born to Walk,” writes Gail Perry, “should be required reading for Canadian politicians, policy-makers, planners and pedestrians.” You can read the rest of the review here. And last, the excerpts in the current April issues of enRoute and Reader’s Digest are both now online, Happy reading — and walking. April 20, 2015 in cities.